What Adaptations Does the Turtle Have to Help it Survive in the Freshwater Biome? The fresh water biome is an aquatic ecosystem that has very little salt content in comparison to the marine ecosystem. Animals in this ecosystem have some adaptations which allow them to survive and thrive in this type of biome. The fresh water biome is the natural habitat of the freshwater turtles, which have evolved or adapted to live in this biome. The heart of the fresh water turtle has evolved for prolonged periods of diving. According to Science Magazine, the heart of the freshwater turtle has a functional ventricular septal defect. This adaptation allows the turtle to shunt the flow of blood from its left to right ventricle when it is on land. When the turtle engages in prolonged diving, the blood is shunted into the aorta directly. Science Magazine states that this adaptation allows the turtle to use anaerobic glycolysis as a sole source of energy during such long hauls of underwater diving. Freshwater turtles are strong swimmers. They have modified hands and feet that have become flippers. These flippers enable them to swim and dive. The neck of the freshwater turtle is fused to its body by thick connective tissue, an adaptation that reduces drag and increases the turtle's ability to swim effectively. Another adaptation that enhances a turtle's swimming ability is its streamlined shell. The shells of freshwater turtles are softer and flatter than those of terrestrial turtles. This structure reduces drag and helps the turtle swim better. Freshwater turtles usually eat aquatic vegetation and small organisms like crustaceans, fish, insects and algae. 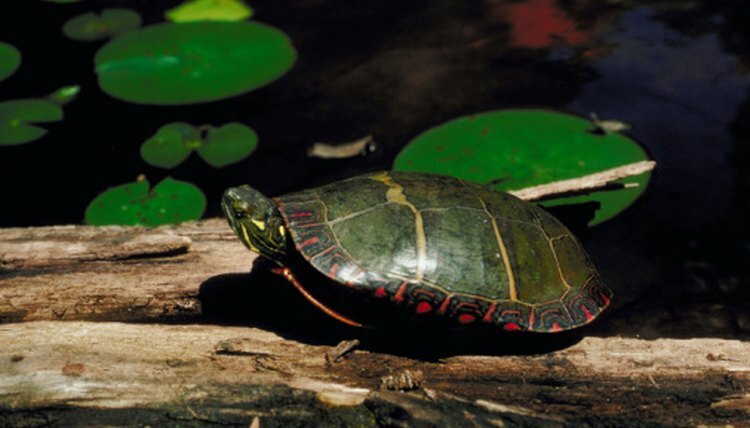 Most species of freshwater turtles, such as the painted turtle, hibernate during the winter. They mate in spring and autumn and lay their eggs during the summer and late spring. Freshwater turtles usually lay their eggs on land. The turtle hatchlings instinctively migrate toward the water as soon as they hatch. Some of the freshwater turtle hatchlings may remain in the nest during the winter months and only emerge during the spring. The freshwater turtles have adapted to survive the cold winter months by developing thick skin that resists the effects of icy conditions. Freshwater turtles regulate their temperature by basking. They usually emerge from the water to bask on logs, other debris or on the sand. Most freshwater turtles bask several times a day. They may bask in the morning, return to the water to feed and emerge to bask some more. When night comes, they may drop to the bottom of a freshwater body, like a pond, and sleep.